Schrodt, Barbara. "Robert Paul". The Canadian Encyclopedia, 04 March 2015, Historica Canada. https://www.thecanadianencyclopedia.ca/en/article/robert-paul. Accessed 19 April 2019. Robert Paul, figure skater (b at Toronto 2 June 1937). Robert Paul, figure skater (b at Toronto 2 June 1937). A specialist in pairs skating, Paul started skating with Barbara Wagner in 1952, and in 1954 they placed 3rd in the North American championships. In 1957, over 16 days, they won the Canadian, North American and world championships and held them for the next 3 years. They won the gold medal at the 1960 Squaw Valley, Calif, Olympics, the first non-Europeans to win the pairs event. After 1960 they continued to skate together on the professional circuit. 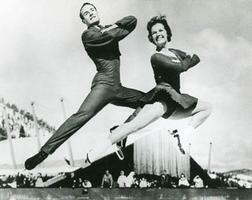 The partnership was dissolved in 1964, and Paul became a skating choreographer and coach in the US.